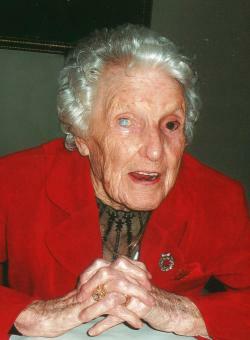 Passed peacefully away at the Placentia Health Centre, Mrs. Mary Drake, age 107 years, formerly of Oderin, Placentia Bay. She will be fondly remembered and sadly missed by her extended family (The Moore Family), Jimmy, Roberta and Laura. Survived by Bill and Lois Drake and family; sister Emma Farrell (Mike deceased); brothers Frank Mullett (Mary Ann deceased) and Jack Mullett; niece Agnes Walsh; nephew Billy Walsh; special long-time family and friends Clem and Jackie Drake and family, John and Doreen Boudreau, Mike and Marguerite Ryan, James and Mary (Deceased) Wakeham, and Sadie Ennis. Predeceased by parents Mike and Theresa Walsh; first husband John Cullen; second husband Francis Drake; friend John F. Moore; sisters Katherine Krasinski, Agnes Walsh Sr., Suzanna Freeman and Theresa Shewmaker; brother Peter Mullett; step-son Kevin Drake; and sister-in-law Sister Genevieve Drake. Thank you to the Staff of the Placentia Health Centre for their help and care during her stay. A special thank you to the Management and Staff of the Beachside Manor for their care of Mrs. Mary Drake for the past ten years. Funeral arrangements entrusted to Maher's Funeral Home, Placentia. Visitation to take place on Tuesday from 2pm to 5pm and 7pm to 9pm. Mass of Christian Burial to take place 10:30am on Wednesday, April 17th at Sacred Heart Church, Placentia, with interment to follow at Dermot McGettigan Memorial Cemetery, Southeast Placentia. Flowers are gratefully accepted, or donations to the Sacred Heart Church in Placentia in memory of Mrs. Mary Drake.